Fresh EU directive will make life harder for smaller tourism firms required to provide full insurance of services. Should a tourist run into trouble during his travel such as airline filing bankruptcy, travel agent pays back full money. For large companies (such as Estravel) the requirement has always applied; however, it will now be extended to the smaller firms providing two services – accommodation and entertainment. The directive is set to enter into force starting July 1st 2018. With a Võru County tourism farm offering accommodation plus a canoe trip along River Võhandu, the new directive sayeth this is package. And a package shall be financially secured. This is for consumers to get their money back in case of bankruptcy etc. All in all, the directive hits over 2,100 enterprises in Estonia. Not limited to that, the directive and its potential side effect – price rise – will affect the entire tourism sector in Europe as we are already seen as a destination costlier and unfriendly towards tourists than some other places. 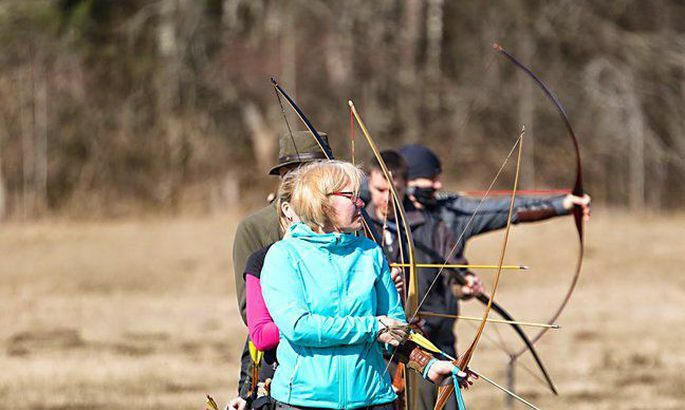 For Katrin Virula, manager of Kajamaa Viburada – and archery track provider under Robin Hood Management – the news of the directive initially brought panic: as lots of others, they do offer several separate services and must now apply the changes. «We will not close shop for some directive. We’ve been doing this for these past 15 years and intend to go on for 15 years more, minimum,» Ms Virula recovered after taking a pause to think. Then adding that should certain extra services like seminar room or sauna rental prove too complex, they will be forced to give that up. With services to be insured adding up, costs for entrepreneurs will probably rise said the economy ministry. As a result of the directive, a larger guarantee is needed and it means for that are lacking, services offered need to be cut or rearranged altogether. Even so, the changes may not be profitable for the companies wherefore they may lead to further decisions of the uncomfortable kind, said Estonian Travel and Tourism Association (ETFL) president Külli Karing. Brussels thinks the directive was needed as the earlier one from 1990 has become obsolete. According to a commission representative, the new directive offers enhanced security for enterprises and travellers alike. Ms Karing said Estonia desired not a directive like that and the way it was written and passed was hasty and not thought thru in needed details. European tourist companies association (ECTAA) president Lars Thykier admitted the directive comes with many a hole. As an example of that, an individual might register several companies and offer just one tourism service from each. Even so, he expressed hopes Estonian government would detect such holes and will manage to close them up. He added that Estonia was in a situation especially complicated with accommodation services VAT rising in 2017. At ECTAA estimate, the directive will probably bring a two percent price rise, minimum. All told, the picture ought to become clearer for consumers regarding what a package holds and what kind of protection comes with it. Also, it will be easier to predict the price levels – currently, companies were able to raise prices just before the trip and the consumer was forced to comply or pay a contractual fine to decline. Now, consumers will be entitled to decline with no costs added, at certain conditions. It will also become clearer who is responsible for a package i.e. who one turns to when running into problems or wishing to file a complaint. The directive will also level the playing field for enterprises while cutting red tape founding companies and creating products at EU level seeing the rules are harmonized. For this very reason, it will be easier for enterprises to extend operations abroad.